Test Your Own Buoyancy. New! 4. How good is Drownproofing? 5. Is Everyone a Natural Floater? 6. If Drownproofing is so good, why isn't it taught at every local pool? 7. Where do I come in? 8. Don't try this at home!? Mikes Notes on Personal Buoyancy. New! Drownproofing can save your life, but must never be regarded as an alternative to normal safety precautions. Always ensure that you are properly equipped and follow the correct procedures for your water activity. Drownproofing is a water survival technique that was invented by Fred Lanoue, swimming coach at Georgia Institute of Technology from 1936 to 1964. Coach Lanoue believed that everyone should be able to survive in water and developed a simple technique that was easy to learn and did not depend on physical strength or intensive training. During his time at the Tech, Fred personally taught his method to 20,000 students. In 1963 he published a book "Drownproofing, a New Technique for Water Safety" that introduced the technique to countless others. Dan Apostolu recalled his memories of Fred Lanoue's Drownproofing course for the Georgia Tech Alumni Association. Jim Chambers just missed out on being taught by Fred, but still qualified to become the proud possessor of a "Drownproofed by Fred Lanoue" card. Most people have a small amount of positive buoyancy that will enable them to float, but not enough to keep all of the head out of water. By floating in an upright attitude, with the face submerged and only lifting the mouth and nose above the surface when it is necessary to take a breath, it is possible to survive indefinitely, with minimal expenditure of energy. If you can already swim a bit, you can probably do this right away. If you are not a swimmer, don't try without competent supervision. Fill your lungs with a good breath of air and float vertically with the back of your head just breaking the surface of the water. Try and adopt the attitude of a kitten being carried by a cat - just hang there and let the water support you. Let your arms float slowly towards the surface, with elbows bent, until your hands are in front of your shoulders. With a steady movement, press downwards and back with your hands until your mouth clears the water. As you come up, breath out and inhale as soon as your mouth is above the surface. Repeat every 10 to 12 seconds. You could use a scissors kick with the legs if you prefer, or arms and legs together if you find it helps to maintain a balanced position. Choose the method that you find the most comfortable. The trick is to get the head just far enough out of the water to get a breath. If the stroke is too energetic, you will come further out of the water than is necessary and go down too far as you drop back. Try and achieve a gentle, easy action. The less effort you make, the better. Getting the breathing right is very important. When your head emerges it should be tilted slightly forward so that the water falls away from your face. Open your mouth wide when you inhale, so as to get as much air as possible. Remember, your lungs are built-in buoyancy tanks! When full, they hold around 4 litres of air. That means 4 kilograms (nearly 9 pounds) of additional buoyancy. On land, you breathe in and out regularly without even noticing. For Drownproofing and for swimming it is important to consciously change the way you breathe. Keep your lungs full of air as much of the time as possible. When you take a breath, exhale and inhale as quickly as possible through your mouth. Drownproofing is incredibly liberating. Anyone can learn and be able to survive indefinitely as soon as the technique is mastered. For the average person, swimming a couple of lengths is about all they can manage, but for the "drownproofer" the limiting factor is that the time comes when the pool staff want to lock up and go home! 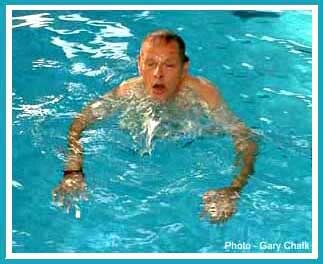 It is particularly useful for disabled people who might have difficulty in learning conventional swimming strokes. Drownproofing is easy to learn. A couple of sessions in the pool is usually all the training that is needed. Having mastered the basic technique, it is easy to learn to move about and make steady, effortless progress through the water. No, a small proportion of people have negative buoyancy. As a general rule, women are more buoyant than men and we all tend to become more buoyant as we get older. Fred Lanoue did a lot of measurements, but lifestyle changes over the last 50 years could well mean that his figures no longer apply. At that time, he found that almost all white people have some positive buoyancy but, in a sample of young African American males, 30% had negative boyancy. Fred's tests were done in a fresh water pool. It is almost certain that everyone can float in sea water. If you are not a natural floater, you can still learn Drownproofing, but the technique is slightly more complex and you will need an experienced teacher. If you are a bodybuilder and diet to reduce body fat and improve muscle definition, you will very likely have negative buoyancy. 6.If Drownproofing is so good, why isn't it taught at every local pool? That is one of the world's great mysteries, but here are some possible explanations. Fred Lanoue invented his technique when television was in its infancy and the Internet hadn't been thought of. He wrote a book, but didn't have modern methods for gaining widespread publicity. Drownproofing doesn't fit with the conventional lifesaving and swimming establishment. It isn't altruistic - you can only save yourself and it isn't a sport that can win medals. It is difficult to convince people that staying afloat is so easy until they have seen a demonstration and tried it for themselves. Teach yourself Drownproofing and teach others. Chances are that you will never be in a situation when you will be directly involved in rescuing someone from drowning, but by passing on the skill you could well be saving lives in the future. Ask your school or local pool to run drownproofing courses. Insist! 8. Don't try this at home! To pass Fred Lanoue's Drownproofing course, students had to float for one hour without touching the bottom or sides of the pool. Then, the final test was to swim two lengths with wrists and ankles tied! An extremely impressive demonstration of the effectiveness of Drownproofing. Naturally, this was done under strict supervision, in a highly controlled environment, with qualified lifesavers standing by. YOU WOULD BE EXTREMELY FOOLISH TO TRY THIS ON YOUR OWN ! However, you can try crossing your ankles and clasping your hands behind your back to practise this advanced technique. The trick is to bend at the waist, into a semi-jackknife position, then straighten up to bring your head out of the water. If you are already a teacher, let us know how you teach, what success rate you achieve, what difficulties you have encountered and how you overcame them. If you owe your life to drownproofing, tell us your story. No fiction, please! Did you know Fred Lanoue? Tell us about him. To avoid being overwhelmed by "spam" e-mails, we have made this address invisible to automated robots. Unfortunately ,this also means that you cannot just click on it, but will have to type it into the "To" box of your e-mail message. We promise to reply to all genuine e-mails. Hypothermia is what happens when the body is unable to maintain its core temperature. The symptoms are confusion, tiredness and eventual death. The criticism has been made that drownproofing is unsuitable for use in cold water because the core temperature of the body drops more rapidly than it would with vigorous swimming. We do not dispute these findings. But it is a bit like those inflatable beach toys that carry the warning "Not to be used as a Life Preserver." If it is the only thing you have, we say "Hold on to it!" In any water emergency, the best advice is to get out quickly. Your aim should be to get on a lifeboat, a raft or any piece of floating wreckage. Swimming for shore should only be attempted if you are certain you can make it. Otherwise, your best bet is to stay near the scene of the accident and wait for rescue. If you can get out of the water, get dry as soon as possible because you lose heat much faster when wet. If you don't have the means to dry yourself, take your clothes off and wring out as much water as possible before putting them on again. If you are not an extremely fit, strong swimmer, Drownproofing is still your best option. If you have a coat with a hood, keep your head covered with the drawstring pulled tight in order to reduce the circulation of water around your head. One of the important plus points of Drownproofing is that you don't have to take your clothes off. Annual drowning figures are approximately 4000 in the USA and around 575 in the UK. This does not include cases that occur while holidaying abroad, where the risks are often greater, because some holiday destinations do not observe the high standards of safety and supervision that we take for granted at home. But that isn't the whole story. After about four minutes without oxygen, brain cells are damaged and many who are rescued from drowning suffer from permanent physical or mental disabilities as a result. However, for most people, drowning isn't the biggest risk they face. Quitting smoking, learning to be a better driver and taking proper care in the handling and storage of firearms, to name but a few, should come high on your list of priorities. But if you have not learned Drownproofing and find yourself in deep water, fighting for your life, you will not get much joy from thinking that really this is a fairly uncommon fate! LANOUE, FRED “Drownproofing, A New Technique for Water Safety“ Prentice-Hall, 1963. Published in the UK by Herbert Jenkins in 1964 and as a paperback in 1966 by Pan Books. Note: The ISBN (International Standard Book Number) system was not adopted until 1969. This was the original work in which Fred Lanoue described his technique. Illustrated with line drawings, it looks a bit dated now, but the technical content is still as relevant as when it was written. As well as describing Drownproofing in detail, he also has some valuable advice about lifesaving and underwater swimming. The forthright style perhaps gives an insight into the author’s character. Dr. Wetmore’s book looks much more modern, though it appeared only 17 years after Lanoue’s. With numerous underwater photographs, he describes every aspect of drownproofing in great detail. An excellent teacher’s handbook; he also explains how beginners can rapidly learn to swim long distances using the ’travel stroke’. Both books are out of print, but secondhand copies can still be found. beachhunter.net Beachhunter has a very comprehensive free ebook	describing the hazards you might encounter in some of the World's warmer waters and how to deal with them. lifesavingclub.com Lifesaving Club has some very good Drownproofing pictures that clearly show how the right sort of clothing can help to provide additional buoyancy. If your site has appropriate material and you would like to exchange links, please get in touch. � Copyright Mike Kearney, 2002/11. This Site is hosted by Easyspace. If you need Web Hosting, why not choose Easyspace? and we will get a small commission to help pay our running costs.